Hiring developers is always a cumbersome task. There’s a lot to think about and it’s a big investment. Hiring Ruby on Rails developers is no exception. There are many different routes you can choose to take, from contracting to hiring someone full-time. The best method is dependent on your organizations needs. As a relatively new programming language, the surge in demand has grown rapidly. Ruby on Rails has become a critical skill for up and coming developers, who can expect to make $17,800 more a year for having it in their back pocket, according to Payscale.com. This extremely sought after role can demand high wages, but a good Ruby on Rails developer can make a huge difference for long-term success. If you’re looking to hire a good Ruby on Rails developer, chances are you are a little overwhelmed. Despite the myriad of resources available, hiring good Ruby on Rails developers can be tricky. Like any job, it is a two-way street and it’s important to make sure that it’s a good fit for both parties before diving in. 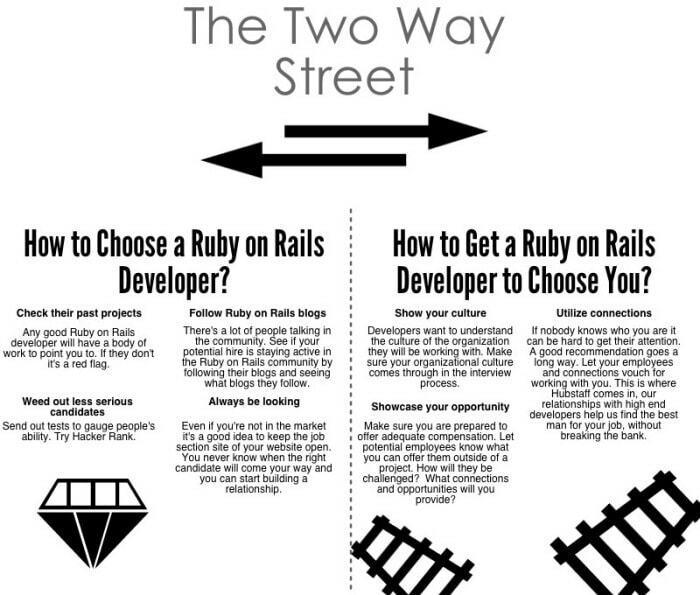 Hiring Ruby on Rails developers is tricky for a few reasons. Since it’s still new, experience doesn’t make a huge difference in judging one’s ability. You can’t weed people out for only having 2 years experience. It can also be hard to get a full understanding of an individuals capabilities in the interview process. High demand also means that developers can be picky. It may be hard to seal the deal if your package isn’t up to par. So how do you do it? How do you find a stellar Ruby on Rails Developer, whose also a good fit for your organizational culture? Your network is your best friend. People who know you and understand what you are trying to accomplish are going to have the best leads. Take a look at your current connections and ask around. More likely than not someone will be able to point you in the right direction. Linkedin will let you easily search Ruby on Rails developers in your network. Don’t stop with professional connections, spread the word to friends, family, even alumni networks. Since trust and personality are such a huge part of the puzzle, it helps to have established relationships. When you don’t know someone personally or through your network, staffing agencies can be a great way to get your foot in the door with potential hires. Hubstaff offers staffing services for Ruby on Rails, PhP, iOS and more(for tips on how to hire a good PhP developer check out this post). Because Hubstaff already has relationships with these developers, they are able to ensure great deals for clients and find the developers who are the best fit for your organization’s needs. Freelance sites such as Freelancer.com and Elance can also be a good way to get a lot of qualified candidates in one place. Since developers like to know who they are working with, connecting with them through Meetups, networking events or Ruby specific conferences and events is a great way to find quality candidates. The benefit of meeting someone in person is that you can quickly get a feel for whether or not they will be a good fit. Attending events also demonstrates your interest and commitment, which is important to developers. Job boards can be a tedious way to find a developer, but when all else fails they get the job done. Stay away from the big name jobs sites and stick to more focused ones. Angel.co, Ruby Inside and Ruby Now are good places to find higher quality candidates and get a better feel for the work they are capable of. It may not be a very reliable way to find a developer, but if you know exactly what you want it’s worth a shot. Reach out, if you see a Ruby on Rails developer that you think is the perfect fit. If you have a compelling package and project, you could wind up with your dream hire.